As noted in prior posts, I’ve recently moved to Photos from iPhoto. So far, it’s been a mixed experience. There are some elements of Photos I like, but as of today, those things are outweighed by the things I don’t like. I’ve vented on a number of the things I dislike on Twitter, but wanted to expand on both the positives and the negatives in more detail. Hence, this “one week in” review (of sorts) of Photos, from the perspective of an experienced iPhoto user. I’ve also included some tips for working with and migrating to Photos for those who haven’t yet made the move from iPhoto. Finally, if you’re still reading, I’ve listed the key features I’d really like to see come to Photos in a future update. Note that I am not a great photographer, but I do take a lot of photos—I have over 40,000 photos and a couple thousand video clips in my database. To keep things organized, I use lots of keywords and Smart Albums, so much of my feedback on Photos is concerned with those areas of the program. The editing tools in Photos are much richer than those in iPhoto (click the image for the full size version, and you’ll see many more options in Photos). This means I don’t have to use an external editor as often as I did before, and that’s a good thing. Photos groups burst mode photos together—as seen on the left of the image below—and you can choose which one you’d like to see as you browse your library. iPhoto, on the right, just shows each burst photo as a separate photo. In this simple example with only four burst photos, iPhoto doesn’t look too bad…but imagine a 100-image burst and what that does for scrolling through your collection in iPhoto. This is much nicer than iPhoto, which as in burst mode, shows one thumbnail for each image version. You can choose whether the raw or JPEG is displayed by entering edit mode for the photos, then selecting Image > Use RAW (or JPEG if RAW is set) as Original from the menus. I do have an annoyance with this method of pairing, which I’ll get to in the next section. 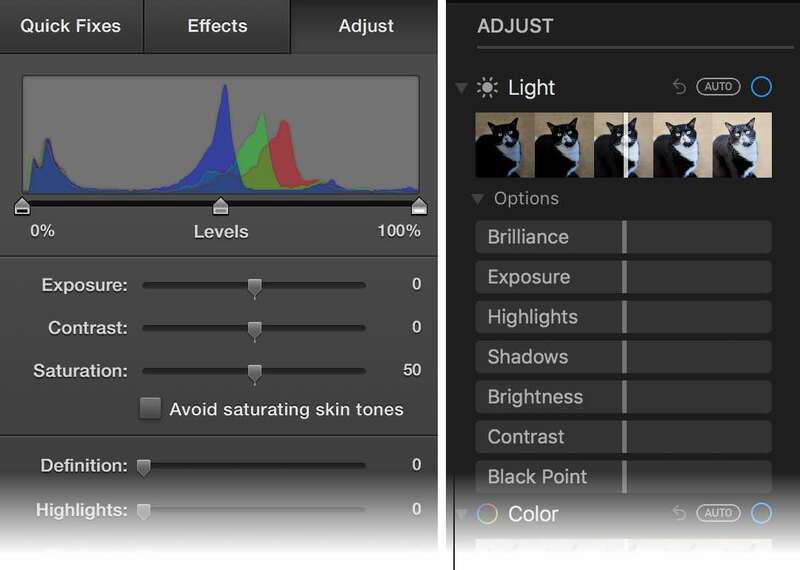 Photos supports extensions which make it easy to add additional features to the program. I’m using one that features an assortment of filters, and access is seamless via the extensions icon (the circle with dots) in Photos’ toolbar area. This is why I actually made the move; if I’d stuck with iPhoto, it would’ve been much tougher to work with the new HEIC format in the iPhone 8. These are roughly ranked in the order of annoyance to me, with the most annoying issue listed first. Note that some of these are one-time only issues (related to migration), and others have workarounds. 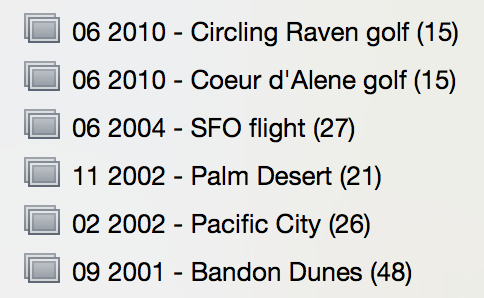 But they’re all things that tripped me up as a migrating iPhoto user. I use a lot of Smart Albums, and in iPhoto, it was possible—somewhat kludgey, but possible—to make a Smart Album with a rule along the lines of “item X and (keywords Y or Z).” You can’t do this in Photos; I came up with a workaround, but it’s less flexible and requires use of an extra keyword for photos you want in such a Smart Album. If you’re trying to arrange your photo albums—be they Smart or regular (stupid?) albums, it’s a real pain in Photos, because you can only select one at a time!. In iPhoto, you can use Shift and Command to select multiple albums. Not being able to multi-select makes even the smallest of reorganization tasks a royal pain. I do not understand the lack of this feature at all; multiple-select isn’t something fancy or that users aren’t used to doing. Oct 13 Update: Thanks to Ed Mechem’s comment for pointing out you can select multiple albums in Photos—you just can’t do it in the sidebar. Instead, select the folder that contains the albums, then you can multi-select in the main Photos window. This isn’t quite as nice as iPhoto, but it does wonders for easing the workflow. Thanks, Ed! I used this feature on a Smart Album in iPhoto to exclude a bunch of keywords that start with a single quote: Keyword – does not start with – ‘. There’s no way to do that in Photos. These options, however, do exist for the Title field, which enables some of what I used to do. It’s not a perfect replacement, however, because it’s just one field, whereas you could have multiple keywords per photo. I may do some fancy titling to get around this, i.e. [value1] [value2] [value3]. I could then make a Smart Album for Title – Contains – [value2]. I use a Smart Album in iPhoto to identify all the RAW images in my library—RAW+JPEG takes up a lot of space, and unless there’s a good reason to do so, I don’t keep all the RAW versions for everything I shoot. This Smart Album made it really easy to find the RAW images I didn’t want any more and delete them. …but it doesn’t work properly. It will show any photos that are only RAW, but images that are RAW+JPEG will only show up if the RAW photo is set to display (as described further down). This makes it virtually impossible to easily find and remove multiple unwanted—and space-consuming—RAW images from your library. I can adjust to this change, given that the Title field replaces the functionality I got by renaming the files in iPhoto. If you select a number of photos, and that selection includes a set of burst photos, the item count shown in the Info window will only reflect one photo for all the burst photos. (If you select just the burst photo in the photo browser, the Info window will show the number of photos in the burst.) Instead of, for instance, “10 photos,” it’d be more useful to see “10 photos (4 burst).” Why? Because if I’m going to delete a selection of photos, I’d hate to accidentally delete a burst photo when I thought I was only deleting a single photo—I use the Info window as my “proof” before I hit Delete. And yes, as described earlier, it’s easy to visually identify a set of burst photos…unless you’re drag-selecting a large group of photos, when you might not notice that one “stacked tiles” photo slide past as you scroll-select. In general, the migration from iPhoto went well. However, I discovered a number of missing or incorrect Smart Albums that I had created in iPhoto. One batch of completely-missing Smart Albums were very simple, just based on matching one keyword. What’s weird is that the keywords imported, but the Smart Albums did not. In addition, any Smart Album that used Events as a rule imported, but the Event rule was simply stripped away—because Events don’t exist in Photos. As a result, I had a number of Smart Albums that contained every single photo in my collection, because the Event rule was the one that was used to narrow down the selection. It would have been nice if the importer created keywords for named events, and put those into the Smart Album in place of the Events rule. The only time you can toggle between seeing the RAW and the JPEG is while editing a photo. Even then, you have to use the menus and your mouse, as there’s no predefined keyboard shortcut for the menu command to switch which photo you’re viewing. This one isn’t critical, but I’d love to be able to switch from the browser—it’d be a nice way to quickly see what RAW photos you’ve edited, for instance, by flipping between the two photos. They already have the mechanism in place to make this easy—click on the J/R indicator to change the displayed photo. If you select the Photos entry in the Library section of Photos’ sidebar, and then open the Info window, you’ll see a count of photos and videos in your library. 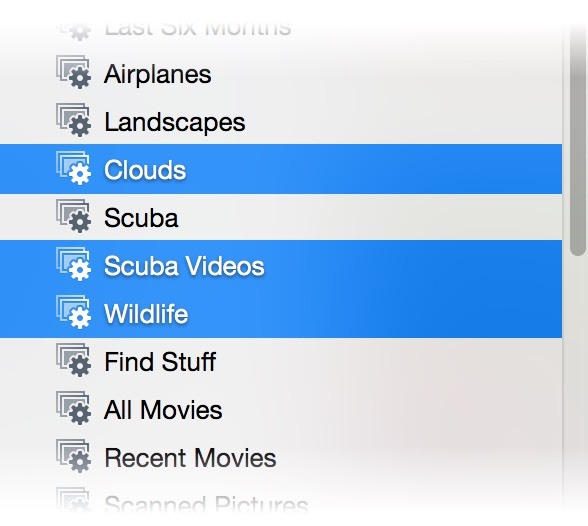 But if you select an album, or a selection of photos and videos, the Info window will only show a total item count—iPhoto showed both figures at all times. Why does this matter? Sometimes when I’m moving things around, I’ll be moving just photos or just videos, and seeing the separate counts in the Info window was a good way to make sure I didn’t select some of the wrong media type. – No album item counts in sidebar In iPhoto, as seen at right, each album (non-Smart Album only) displayed its image count. This made it really easy to tell, for example, if I’d set up an album and then gotten sidetracked and forgotten to add any photos. By comparison, Photos will show you item counts, but only in the Info window, which means you can only see one album at a time, and must click through all of them to get photo counts. I don’t always need to see these counts, but it’d be nice if I could see them. I don’t like the Memories feature at all. Why? It takes CPU to create them, many of them are just plain dumb, and some could potentially remind me of things that I’d rather not see memorialized in an album. Let me turn it off, just like you can turn off sections of iTunes you don’t use. If you’re using a device that doesn’t auto-set location data—like my Nikon—then you have to manually assign locations within the app. In Photos, this is done on a postage-sized map in the Info window. And yes, I’m aware you can type in locations and there’s a great auto-completing list of places (iPhoto had the same). 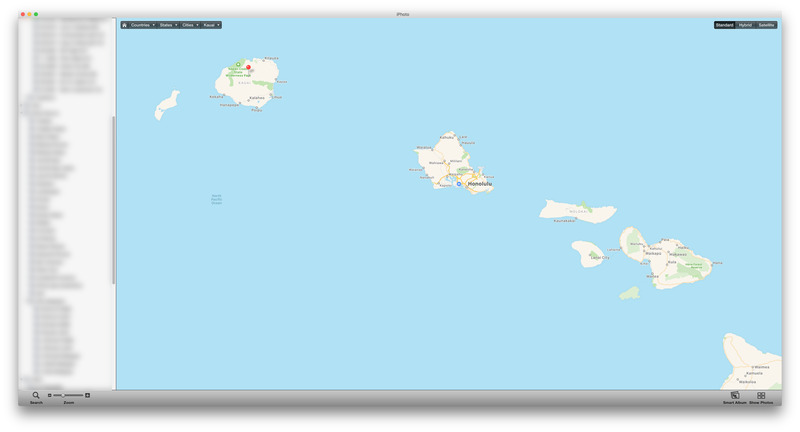 But sometimes, you want or need to be able to finely position a pin on a map; in those cases, the huge map in iPhoto is the winner. Events in iPhoto were a good way to group photos together, regardless of when they were taken—you could drag and drop photos between events, and merge or split events, etc. Photos will import your existing events as albums, but has no event support of its own. This isn’t a critical issue, but it requires a change in my workflow—more keywords and Smart Albums to replace the grouping I used to do via events. The good news is that the Title field is a good replacement for renaming the actual files. During the migration, Photos automatically created titles for most—but not all—of my renamed files. You can see which photos have titles by using a Smart Album: Title – is not – empty. And if you, like me, find that a number of your renamed files don’t have Titles, this AppleScript will copy the filename to the title field for a selection of photos. Problem resolved, other than having to recreate a number of Smart Albums. Before migrating, if you use Smart Albums with only one rule, and that rule is based on matching a keyword, you may want to add a second innocuous condition: Filename – is not – [leave blank], for example. This should hopefully force Photos to import these Smart Albums. If you have event-based Smart Albums in iPhoto, consider converting them to Keyword-based Smart Albums before migrating. Your events will be imported (as albums), but any Smart Albums that have Event as a rule will have that rule removed after migration. If you like having the Info window open and resize the main window often, you’ll find the Info floating by itself, distanced from the main window. I crafted a solution using our own app Moom, but there are similar apps available. You cannot make “and+or” Smart Albums. I came up with a workaround, but it doesn’t allow quite the same flexibility as what was possible in iPhoto, and requires more work. If you like to make sure your photos are tagged with location data, and use a Smart Album to find untagged photos, the language has changed in Photos. 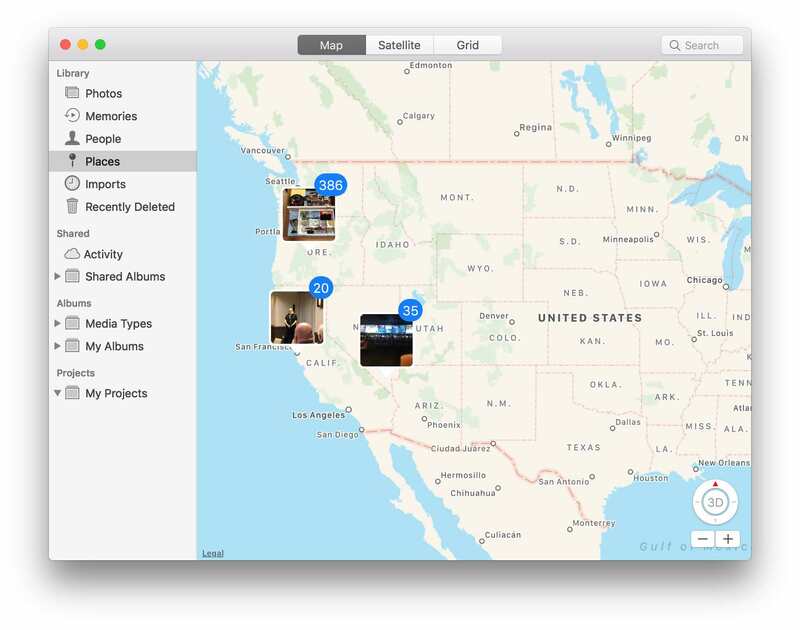 You’ll want this Smart Album: Photo – is not – tagged with GPS. I had assumed that meant what it said, that it would only find photos not tagged with GPS data. But it really means photos without location data, whether from GPS or manually adding. If you renamed photos in iPhoto, you’ll find you can’t do that in Photos. Use the Title field instead; this AppleScript assigns Titles based on each photo in a selection’s filename, in case the migration tool misses some, as it did for me. Depending on how you used iPhoto, you may find yourself needing a lot more keywords to accomplish the same thing in Photos. For now, I have no workaround for that, only hopes that Smart Albums get much smarter in a future update. And finally, my suggestions for improvements I’d like to see in Photos–I don’t want them to bring iPhoto back, but it would be nice if what is supposed to be the photo management tool for macOS was actually powerful enough to do the job well. Not everything on my negative list needs to be added to Photos—I understand that this is a different way of doing things, and that my workflows must change. I’m OK with that, but there are some things that would be (seemingly) relatively easy to add that would greatly improve things. These are roughly ordered from my personal most-important missing feature to my least. Given that collections in Photos can be massive, Smart Albums should be truly smart: Let us build multiple and+or rules, as you can in Finder—or iTunes, for that matter. Give us access to more of the data about photos, such as building a Smart Album around photo resolution or location. Let Smart Albums reference other Smart Albums—again, as you can do in iTunes. Add more options for Keyword-based Smart Albums, such as “contains,” “starts with,” etc. It’s a database, right? So let us do “databasey” stuff with it then! Honestly, I have no idea why this doesn’t “just work.” It would greatly ease organizing large, complex libraries. I think Apple probably had to work harder to make this not work! Burst photos are more than one photo, and should be reflected as such in item counts. Selections—either groups of photos or an album—that include both stills and video should report the total of each, as works in iPhoto—and in Photos when you don’t have anything selected. Just because a RAW photo is part of a RAW+JPEG pair doens’t mean it doesn’t exist unless it’s visible. A Smart Album that finds all RAW photos should find all RAW photos. I can already disable summarization of photos, why can’t I disable Memories, too? There should be a way to use a larger map when setting a photo’s location. It could be within Photos, as it was in iPhoto, or maybe through a link to Maps. But working on that tiny map in the Info window is not a pleasant experience. I know not everyone likes or needs this, but for those who do, let us see the number of photos in each album without having to select the album. To add to the desired features: For god’s sake let us change the background color of the photo browser from blinding white!!!! Yep, that’d be a nice one, too! You can select multiple albums. You just can’t do it in the sidebar. Click on the item that contains them, then in the main part of the window (not the sidebar) you can shift or command click to select multiple albums. Oh wow, thanks for that! While not quite as nice as iPhoto, it goes a long way to helping with reorg projects. I’ve added a comment to the article, too, for those who don’t read comments. Also, ahem – looks like you’re not a huge user of Faces. As a big user of this feature the one aspect that didn’t make the transition from iPhoto to Photos, is – the ability to make a smart album on the Face being “Unknown”. This *was* a huge help finding Faces that had been identified but not assigned to a particular person. Especially nice was the ability to tackle, say, a specific time range AND Face = Unknown. Then this smart album’s count would decrease as you worked your way thru it, until it’d be empty when you’re done. No longer possible. Kinda demotivational when you can’t even know how far along you are in the seemingly infinite task. Apple, please bring back “Unknown” as a selectable Face in Smart Album criteria. 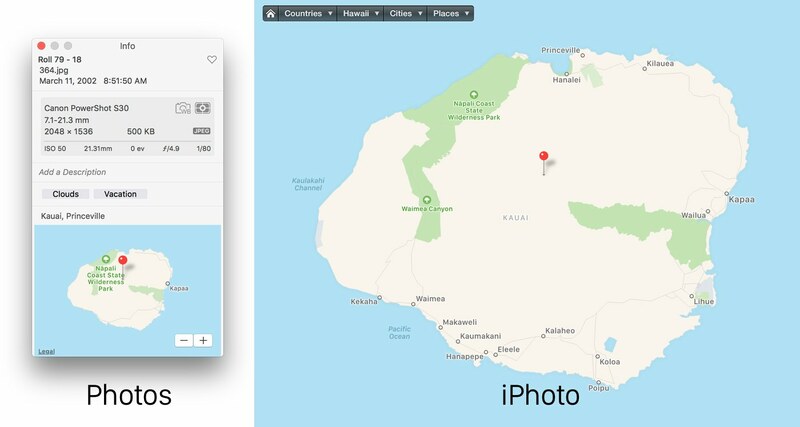 You mention the shortcomings of the map for assigning a location, but does Photos still lack iPhoto’s map for _finding_ pictures? That was why I bought my first GPS phone, and why I avoided the initial Photos. And does Photos have any way of associating a GPS track or waypoint file with imported photos the way Aperture (in its own clunky way) does? I don’t think so. I haven’t ever tried, but I searched the manual and didn’t find anything. I’ll probably continue to do this as I did with iPhoto, using a data logger and HoudahGeo to pre-tag the photos before import. Photos has a Places item in the sidebar that shows where photos were taken, like this — is that what you meant? Ooh, thanks for that (not to mention Mac OS X Hints); a great relief, for when I presumably am eventually forced to switch. When my migration took place, many of my photos didn’t migrate. There are just blank spaces where there should be a photo. How do I complete this migration. Can anyone help? I was happy with iPhoto for arranging thousands of pics used in my magazine farmideas.co.uk and used iphotobuddy to make libraries. I have 50 libraries of 300 – 500 photos,and this means I can find one in under a minute, without knowing the pic number. One for each issue. Buddy doesn’t seem to work with photos. iPhoto allowed pics to be rated, and then sorted by rating. Easy to collect all the images needed together. iPhoto has the pic number underneath and it could be copies and pasted into the text. No can do with Photos. Apple doesn’t seem to realise that this is a program used seriously, every day,and is a feature of the brand which keeps us loyal. How is it that moving from10.9.5 to 10.10.5 has such a huge detrimental effect on my work? Using favourites in Photos is clumsy and difficult, even after a month of getting to know it. I just talked to support and begged him to go to a staff meeting and the powers to be to quit horsing around with Photos so that it appealed just to the young ones who want to quickly share a photo on Instagram. Many of us have used it as a tool to organize a lifetime of photos. We have created books and cards (that feature is now gone). We created DVD’s to share. He said that might come back. Anyway, stop making it trendy and give us back the solid, robust and professional organizing tool that it once was.